A method of estimating an investment's current value based on the discounting of projected future revenues and costs. The answer derived from the technique is only as accurate as the estimates used, which, in many cases, are far from certain. Discounted cash flow (DCF) is the present value of a company's future cash flows. DCF is calculated by dividing projected annual earnings over an extended period by an appropriate discount rate, which is the weighted cost of raising capital by issuing debt or equity. The discount rate is lower for stable, well-established companies than for those considered at potential risk. Some analysts use only projected dividend income in calculating future cash flow. Others include projected earnings that would be available for stock buybacks. Fig. 34 Discounted cash flow. Examples of two investment criteria for a machine: cost £5,000, estimated life 2 years, cash receipts/inflows £5,000 (year 1), £3,000 (year 2). A method used in INVESTMENT APPRAISAL to evaluate the desirability of an INVESTMENT project. Discounted cash flow is the CASH FLOW associated with an investment project that is adjusted to allow for the timing of the cash flow and the potential interest on the funds involved. Such an allowance for timing is important because most investment projects have their main costs or cash outflows in the first year or so, while their revenues or cash inflows are spread over future years. For example, if the INTEREST RATE was 10% a company could invest £100 now and have it accumulate at compound interest to £110 at the end of one year and £121 at the end of two years. So £100 in the hands of the company now is worth the same as £110 in one year's time, or £121 receivable in two years' time, that is, it has a present value of £100. The net present value investment criterion uses this principle to calculate the present value of the estimated stream of future cash outflows associated with an investment project, and the present value of the estimated stream of future cash inflows from the project, and to compare the two. 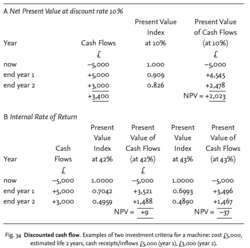 If the present value of the cash inflows from the project exceeds the present value of outflows when both are discounted at, say, 10%, then the net present value is positive (see Fig. 34 A). If the firm's cost of capital (based on market interest rate) was 10% then it would be worthwhile for the company to undertake this project, because it will earn a return in excess of its financing costs. The internal rate of return investment criterion seeks to calculate the percentage internal rate of return which will equate the present value of the stream of cash outflows associated with an investment project, with the present value of the stream of cash inflows from the project, so as to give a zero net present value. For example, in Fig. 34 B, the calculated internal rate of return is just over 42%, this being the rate at which net present value is zero. This calculated internal rate of return can then be compared with the firm's cost of capital which is usually based on market rates. If the calculated internal rate of return (here 42%) exceeds the cost of capital (say 10%) then the project is worthwhile; otherwise not. Whether or not the machine has a positive net present value, or an internal rate of return which exceeds the cost of capital, depends upon how accurate the future estimates of sales volumes, selling prices, materials costs, etc. turn out to be. Since all investments involve assessments of future revenues and costs they are all subject to a degree of uncertainty. This problem can to some extent be handled by undertaking sensitivity analysis, and by making not one but three estimates for each item of project cost or revenue (‘optimistic’, ‘most likely’, ‘pessimistic’) to indicate the range of possible outcomes. a cash flow associated with economic projects that are adjusted to allow for the timing of the cash flow and the potential interest on the funds involved. Such an allowance for timing is important, for most INVESTMENT projects have their main costs or cash outflows in the first year or so, while their revenues or cash inflows are spread over many future years. For example, with interest rates at 10%, a company could invest £100 now and have it accumulate at compound interest of £110 at the end of one year and £121 at the end of two years. So £100 in the hands of the company now is worth the same as £110 in a year's time or £121 in two years’ time. Looking at this cash flow the other way round, the company would regard £110 receivable in one year's time or £121 receivable in two years’ time as having a present value of £100. Following this principle, it is possible to calculate the present value of the estimated stream of future cash outflows associated with an investment project and the present value of the estimated stream of future cash inflows from the project and compare the two. If the present value of the cash inflows from the project exceeds the present value of outflows when both are discounted at, say 10%, then the net present value is positive. This suggests that it would be worthwhile for a company to use its own money or borrow money at 10% and undertake the project, for it will earn a return in excess of its financing costs. Alternatively, it is possible to calculate the percentage internal rate of return that will equate the present value of the stream of cash outflows associated with an investment project with the present value of the stream of cash inflows from the project, so as to give a zero net present value. This calculated internal rate of return can then be compared with a predetermined DISCOUNT RATE that is usually based on market rates of interest. If the calculated internal rate of return (say 15%) exceeds the discount rate (say, 12%) then the project is worthwhile, otherwise not. See CAPITAL BUDGETING. Also known as a present value analysis; an approach to analysis of an income-producing property by calculating the present value of a future income stream with the use of a discount rate.The two most common methods are the internal rate of return method and the present value method. The results reveal higher EM levels for companies that use discounted cash flow and for those that are less compliant with the disclosure requirements of CPC 29. With the introduction of discounted cash flow evaluation, the required loan-loss reserves are expected to be revised up at least 10 percent and require additional reserves of at least [yen]1 trillion. This paper reflects on the current textbooks' treatments of the underlying assumptions of the discounted cash flow (DCF) method, its many applications, and their relationship with some of the other crucial topics discussed in the same textbooks. However, rather than valuing, for example, an oil company as a whole, each individual well is valued using a discounted cash flow method. Analyze historical and projected financial results; compare the company's performance with its peer group; scrutinize the valuations of similar transactions within the industry; and perform both a premium and discounted cash flow analysis. Some accountants used discounted cash flow, which FAS 121 calls for, but others used gross cash flow or the present market value of the asset compared with the time of purchase. Chapter 9 discusses other valuation methods with two pages only on discounted cash flow. When related to facilities or marketing expenditures, the ROI should be expressed in terms of discounted cash flow (DCF) return on investment. The discounted cash flow method first projects company cash flows for three to 10 years, then calculated a present value using a discount rate that incorporates the risks of achieving the forecasts. Several methods of analyzing the discounted cash flow exist.